Gold Boos are golden variants of Boos. A Big Gold Boo leaving a trail of coins. Gold Boos first appear in New Super Mario Bros. 2 when Mario or Luigi touch a Gold Ring. They begin to flee upon turning gold, leaving a trail of coins behind for the player to pick up. Just like all the other golden enemies, they give five coins to the player upon defeat. Big Boos also have the same effect and turn into Gold Big Boos. 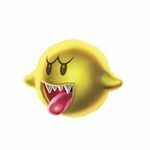 A Boo with a similar color scheme as a Gold Boo appears in Paper Mario: Sticker Star in the Mansion Safe in The Enigmansion, where it acts identically to a regular Boo, but drops twelve coins after the battle. In Mario & Luigi: Superstar Saga + Bowser's Minions, a gold variant of Captain Boo is unlocked whenever the Boo amiibo is scanned in the Minion Quest: The Search for Bowser mode. ↑ 'von Esmarch, Nick. New Super Mario Bros. 2 PRIMA Official Game Guide, page 36. This page was last edited on February 9, 2019, at 14:59.